A large decorated 3 tiers fountain complete with four-leaf clover coping around. 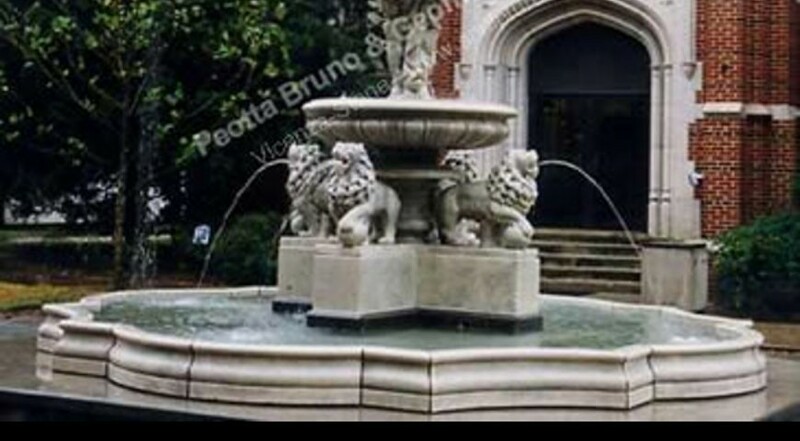 The central fountain has a 4 lions base with spheres (drilled for water). The bowl are carved with bugne details. A group of cherubs over the large bowl, with drapes and leaves decoration. The little base on the top with lion's head masks drilled for water. On the top finial a nice cherub with little dolphin also this element drilled for water. This is an original design made in early 1900 from sculptors that worked in the Venice area.